Book Review: “Owen on the Christian Life” by Matthew Barrett and Michael Haykin | J.W. Wartick -"Always Have a Reason"
Owen on the Christian Life provides a broad-spectrum approach to John Owen’s theological insights into the Christian life. It is part of the “Theologians on the Christian Life” series from Crossway (see my other reviews in this series here). John Owen was a Puritan. Yes, one of “those people.” The word “puritan” has something of a bad connotation nowadays, but the theological movement was actually remarkably broad. Moreover, many insights can be gleaned from reading through the works of these theologians who emphasized a Christian life lived. The authors outline Owen’s theology through a number of chapters that build on each other, including chapters on the Trinity, penal substitution, justification, and more. 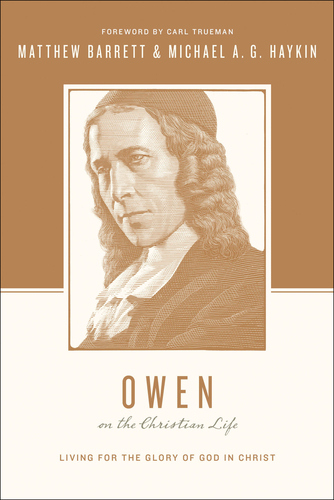 Readers also learn about Owen’s transition towards congregationalism, discussions about church and state, and more. Central to Owen’s theology are the Trinitarian relations, which can help us to learn about divine-human and human-relations as well. Owen emphasized the importance of religious experience for the Christian life. This experience was never taken to trump the authority of the Bible–far from it. Instead, it was taken to be a bulwark in times of doubt and need. Justification in Owen’s view provides a way to be assured of one’s salvation, for God completes that which God has set out to do. Sanctification is where I believe Owen’s main contributions might be found, though I will outline that more below. The primary critique I have of the book is that it doesn’t seem to focus on Owen’s specific views of the Christian life as the other works in the series have. As I outlined above, there are chapters emphasizing various aspects of Owen’s theology, but these only get tied into the Christian life in what seems like offhand fashion at times. This makes the book read more like an exposition of Owen’s broader (largely Calvinistic) theology than a specific look at his doctrine of the Christian life. Particularly surprising to me was how Owen’s insights on sanctification and overcoming sin and temptation were lumped in with discussions of the power of prayer and the indwelling Spirit. Perhaps this is at least partially my own bias, having been edified greatly by his works on sin and temptation, but I think that more space dedicated to his work in this area would have been on point in a book on the Christian life. That said, the authors do a good job summarizing Owen’s approach to overcoming sin and putting it to death in our lives. Owen argues for several steps a Christian can take to battle sin and temptation in their lives. This is a proactive approach which views the Christian life as a Spirit-empowered battle against the temptations we face. Steps Owen describes include the envisioning of the consequences of sin, reflection on the Bible, and realizing the fact of the suffering our sin causes Christ. Owen on the Christian Life provides insight into the whole of Owen’s theology, with a focus on his theology of Christian living. It’s not necessarily as focused on the topic at hand as some other books in the series, but it is a worthy read that provides an introduction into the thought of this theological giant. Book Review: “Overcoming Sin and Temptation” by John Owen– I review a book from John Owen which has positively impacted my spiritual life in many ways. Matthew Barrett and Michael Haykin Owen on the Christian Life (Wheaton, IL: Crossway, 2015). Yeah I’ve just been going through them as they pop up. I requested a couple I missed, so hopefully they will be added to the list at some point. I’m hoping to get my hands on Bonhoeffer and Edwards soon.